Merge-mining has made headlines recently with the announcement of Dogecoin merge-mining under Litecoin (i.e. Dogecoin is the “child”, Litecoin is the “parent”). It is a concept that has been around for a while and implemented by a handful of coins, including Bitcoin. Put simply, a miner performs the same hash on both the parent and child blockchain and can solve blocks on either chain at no extra cost. The concept has yet to really take off as anything beyond academic because of a problem very parasitic in nature: The child coin’s price is at the mercy of the parent coin’s miners. In Dogecoin’s case, dogecoins become “free lunch” for Litecoin miners that they can sell for an extra BTC or LTC profit. For merge-mining to be a successful tool it needs to be given a symbiotic environment. There must be a mutual balance that doesn’t leave one party with a bad taste in their mouth. With “mono-proof-of-work” (mono-PoW) coins like Litecoin and Dogecoin that utilize one algorithm (Scrypt) to solve blocks, there is no obvious way to balance blockchain security (i.e. Litecoin’s larger network hashrate) with the inevitable selling pressure that is to follow (i.e. Litecoin miners dumping their “free” dogecoins for BTC/LTC). Even the perceived imbalance is enough to damage the child coin’s value; if Litecoin miners do not sell their dogecoins at the rate that the market anticipates, the market will still react as if the dumping is occurring at that higher rate. It is a self-fulfilling prophecy where one coin is placed a metaphorical pedestal above the other. Luckily, with the emergence of Myriadcoin’s “multi-proof-of-work” system (multi-PoW), a healthy partnership can be constructed between the two coins. Myriadcoin’s upcoming PolyMYR project, a merge-mining and auto-exchanging pool, will double as a cryptocurrency laboratory where the multi-vPoW solution can be rigorously researched and tested. To understand the solution best it requires a brief recap of how a multi-PoW system like Myriadcoin works. Myriadcoin has 5 algorithms (SHA256d, Scrypt, Skein, Qubit, and Myriad-Groestl) that can independently solve blocks. They have independent difficulties that are adjusted using the same formula. Any algorithm can solve the next block even if it is the same algorithm. Each algorithm targets the same block time and the block rewards are the same no matter which algorithm solves the block. The multi-vPoW solution involves adjusting block rewards based on which algorithm finds the block. With Myriad as a parent multi-PoW, the child coin can become a multi-PoW (if it isn’t already) that selects a few algorithms that are merged-mined by parent Myriad algorithms and an algorithm(s) that is not merge-mined (creating a degree of overlap). The merge-mined algorithms would be programmed to have lower block rewards than the non merge-mined algorithm(s). This immediately creates many variables (number of merge-mine algorithms, number of non-merge-mine algorithms, block rewards, etc.) that can be tinkered with to create a proper balance of give and take. For example, a developer wants to start a new X11 coin but is worried that a competitive and saturated altcoin mining arena may leave the coin prone to 51% attacks for lengthy periods of time early on. The developer wants guaranteed network security from the moment it launches so they decide to launch it as a multi-PoW with 5 algorithms: SHA256d, Scrypt, Skein, Myriad-Groestl, and X11. 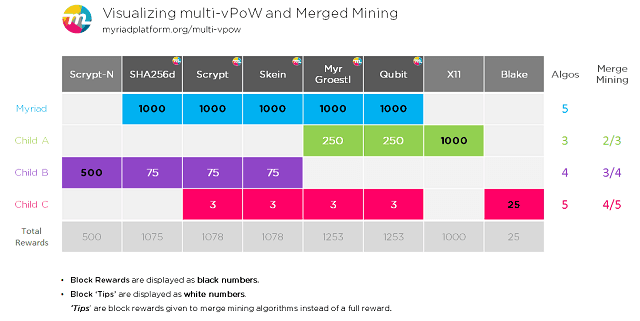 Merge-mining is enabled on the 4 algorithms it shares in common with Myriad (SHA256d, Scrypt, Skein, and Myriad-Groestl) while the X11 algorithm is devoid of the auxPoW merge-mining code. The 4 merge-mine algorithms could then be designed with block rewards of say, 25, while the block reward for X11 is 200. This would create a 25-to-200 ratio for the block rewards. Or maybe the ratio would be set to 40/200 or 10/200. Whatever the ratio may be, the bottom line is that Myriadcoin miners are paid for their contributions to the network security of the new coin in a manner that is not detrimental to the long-term value of the coin. So long as there is a fairly-balanced block reward design, Myriad miners should not have reason to complain about lesser block rewards because the child coins are ultimately “free lunch”. At the same time, the developer should not deprive merge-mined algorithms of block rewards altogether or else the merge-mining symbiosis becomes parasitic against the parent coin and the child coin would be dealt with naturally by the free market. It’s a matter of mutual respect that eliminates any real or perceived damage to either coin in the merge-mining partnership. Merge-mining symbiosis via multi-vPoW could even be enhanced by utilizing complimentary blockchain technology. For example, an implementation of multi-vPoW colored coins could offer miners the choice of coloring their merge-mining coins into tokens that represent the amount of network security they provided. This would act as a deflationary tool (that isn’t a scam!) for the child coin that still rewards the parent coin miners with more profit/value given that creative ways to use the colored security tokens are constructed. Even further, while I understand that PoS block rewards are currently not compatible in merge-mining environments, it may be intriguing to innovate a way for merge-miners to stake their child coins rather than sell them right away. Finally, a means to achieve meta-stability within merge-mining symbiosis may be desirable and achievable from real-time data analysis of relative network hashrate on each merge-mining algorithm. Hypothetically, the child coin block rewards for a merge-mined algorithm may be constructed to dynamically change based on the size of the network hashrate of that algorithm relative to the rest of the network. If too many miners are loaded up on one algorithm, the block rewards may be temporarily lowered while the block rewards on a smaller algorithm network could be raised. This could incentivize a migration of miners from the crowded algorithm to the sparse algorithm to prevent extended duration of low individual network hashrates. These are a few solutions that will be explored by Myriadcoin and PolyMYR. If anything, I hope to spark a lively discussion about elegant solutions for merge-mining symbiosis. I do not pretend to know if these ideas will succeed, but I can assure you they will be explored. We love to push the envelope on the Myriad platform. Should Myriadcoin’s exploration of meaningful innovation spark your interests, I implore you to join our community and development team. We are always looking to grow! Join us on /r/myriadcoin or swing by our IRC channel (##myriadcoin on Freenet).